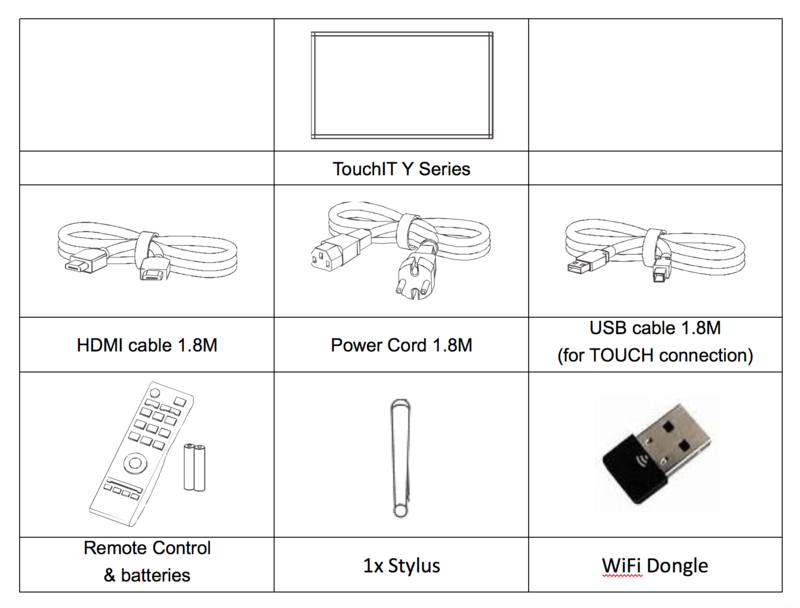 Once you have installed your TouchIT Y Series either on the wall or the rolling cart and you have connected the power cord and switched the unit on, the next thing that you are going to want to do is connect to the internet. You have two options to connect your On Board Android on the TouchIT LED to the internet. The fist is connecting via WIFI and the second is using an Ethernet Cable and the RJ45 connector on the rear of the unit. You need to insert the WIFI Dongle into one of the side input ports on the left hand side of the LED at the Rear. Please insert the dongle into the top USB port. Now you need to navigate to the Settings Menu in Android to turn on wifi, search for your networks and then connect. To Do this, swipe up from the bottom of the LED to show the Android Swipe Menu and choose the Settings Option. Then you need to chose the LAN and Network and Equipment, then the WLAN option. At the top right of the LED is a a switch to then turn the WLAN on, make sure it is in the on position and the LED will then search for your wireless networks. Select the network you wish to join and then enter the password for the network. You will then be connected. Plug one end of the Ethernet Cable into the RJ45 socket on the right hand side rear of the LED and the other end into your Ethernet Port in your school or business. If your internet settings are automatic DHCP enabled, then your Y Series will automatically find the IP Address and the DNS settings from your network and connect automatically. After about 5 seconds, you will receive a notification that shows that the unit has been connected. If you need to enter your settings manually, then you need to enter the network settings menu on the On Board Android. To Do this, swipe up from the bottom of the LED to show the Android Swipe Menu and choose the Settings Option. Then you need to chose the LAN and Network and Equipment, then the Ethernet option. You then have the option of a Static IP Address which is where you can enter your IP settings manually.